Sweet Home 3D is a free interior design application that helps you placing your furniture on a house 2D plan with a 3D preview. • Draw walls and rooms of your home from scratch or upon the image of an existing plan, on one or more levels. • Change the color or the texture of the walls, the floors and the ceilings, importing images of your own patterns if needed. • Drag and drop doors, windows and furniture onto the plan from a catalog of 1205 objects organized by categories, in which you can import 3D models created by yourself or downloaded from the web. • Customize the size, the orientation, the elevation, the colors and the textures of each piece of furniture. • View the changes in the plan simultaneously in a 3D view, in which you can navigate either from an aerial view point, or from a virtual visitor view point. • Create a photorealistic image of your arrangement depending on the time of the day and the light sources placed in the plan. • Create a video from a virtual path in the 3D view. • Annotate the plan with room areas, dimension lines, texts, arrows and a compass rose. 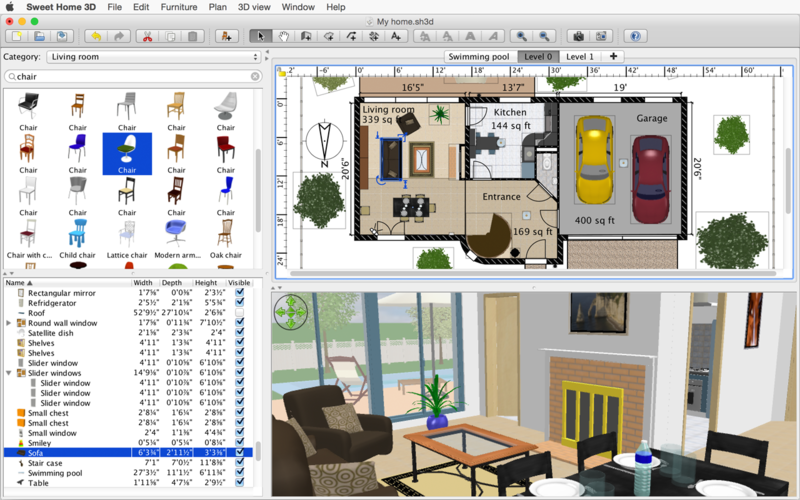 • Print the home plan and the 3D view or export them in files at PDF, PNG, JPEG, SVG, OBJ standard formats, to reuse designed homes in other software. Next story SyncMate Expert 7.3.434 – Sync your Mac with Android, iOS, other Macs, and more. Previous story Paperless 3.0.3 – Digital documents manager. Home Design 3D Outdoor & Garden 4.0.2 – Bring all your outdoor design projects to life!